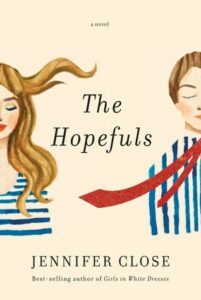 If you were a fan of Jennifer Close’s The Smart One or Girls In White Dresses – as I was – then you will want to give her new novel The Hopefuls a read. While Close’s first two novels dealt with the confusing, rootless post-college mid-20s, The Hopefuls is about a young married couple in their late 20s who moves to Washington, DC in the early years of the Obama presidency. Beth and Matt Kelly start out living in New York, but they head south so that Matt can work in the administration after Beth loses her job in magazine publishing. Beth is a bit bewildered by the ways of Washington; she tires quickly of cocktail party conversation about who does what in the White House (and therefore who has more exposure to POTUS), and she hates pretty much everything else about the city – the weather, the dowdy clothes, the transience of its inhabitants, and the proximity to Matt’s large family. Soon, however, Beth and Matt develop a close friendship with another couple, Ash and Jimmy, which turns things around for Beth. Jimmy and Matt are both ambitious, but while Matt makes lateral moves through the administration, Jimmy gets promoted, leaves to work at Facebook, and ultimately gets recruited to run for state office in his home state of Texas. Beth and Matt decide to move to Texas so that Matt can manage Jimmy’s campaign, a move that tests both marriages and each of the friendships. Close’s narrators tend toward the passive, and Beth is no exception. She spends her whole year in Texas with very little to do, just reacting to Matt’s moods and helping Jimmy when she can. She doesn’t assert herself when she is wronged – she just lets things happen to her, shrugging them off when they hurt her feelings. But I still enjoyed the way The Hopefuls unfolded, and wanted to see how things turned out for her. I also liked all the detail about DC – the restaurants, the acronyms, the annoying people trying to get ahead. It’s my hometown, and I love it, warts and all. I found The Hopefuls to be a satisfying read. Just be warned: if you decide to pick it up, don’t expect a lot of action, and be prepared to want to shake Beth from time to time. The Hopefuls comes out in July. A few weeks ago, I posted a Q&A with Jennifer Close about her new novel, The Smart One. Like her previous novel, Girls in White Dresses (reviewed here), Close’s latest work looks at the disorienting years that follow college. This time, she follows three siblings in their twenties/early thirties: Martha, Claire and Max. None of them is living the life they expected: Martha abandoned her nursing training years ago to work at J. Crew and still lives with her parents; Claire called off her engagement and is living beyond her means in Manhattan; and Max, a senior in college, has just gotten his girlfriend Cleo pregnant. Their parents, Weezy and Will, live in a Philadelphia suburb, befuddled by their children’s less-than-enviable situations yet determined to support them by opening their doors for them to return home. Like in Girls in White Dresses, Close’s style of writing is heavy on description and anecdote and light on plot. Not too much happens in The Smart One beyond the summary I included above. The whole book takes place over a 12-month period and there are only about two or three notable things that happen to each person. The richness of The Smart One lies instead in the details Close uses to flesh these characters out. I loved the little flashbacks and anecdotes that made me feel like I knew this family (particularly the women) so well. Someone on Goodreads described Close’s style as “simple and effortless”. I totally agree. The book reminded me of the endless hours I used to spend on the phone with my close friends, dissecting and analyzing other people’s lives. I miss those conversations – I don’t have those hours to spend these days (and does anyone use the phone anymore?). The Smart One was like a whole book full of them. I suspect that The Smart One isn’t for everyone. It is definitely full of #FirstWorldProblems, and Claire and Martha in particular can be frustrating in their passivity and self-pity. This family is not out saving the world, and they aren’t even particularly nice to each other much of the time. But I thoroughly enjoyed this book, and looked forward to each brush stroke that brought Close’s characters into closer relief. The Smart One is like an Impressionist painting – each individual square inch may feel sketchy and incomplete, but taken as a whole it forms a lasting picture. One little quibble (because of course I have one little quibble) – the title. The Smart One refers to Weezy, in relation to her sister Maureen (who, it turns out, is also pretty smart). This book doesn’t ultimately revolve around Weezy, nor does it particularly revolve around Weezy’s relationship with Maureen. I wonder if Close picked the title out when she thought the book might be going in another direction. It was a little disorienting; I kept having to remind myself who “the smart one” was, and then shifting gears again to get back to the kids. Of course titles aren’t that important, but like covers, they do contribute to the overall gestalt of a book, and this one didn’t seem to fit.